Whether pitching to prospective clients or posting growth hacking tips on Instagram, Justin Wu has found that using Lucidchart can make the difference. Justin uses visuals to make an impact. He creates a roadmap to show what deliverables the client will receive and what Growth.ly will achieve for the client, making it easy for clients to consume and understand the solutions and the value. Justin builds wireframes for clients that show the changes he would make to the UI/UX of an existing app in order to improve the user experience. Lucidchart takes Justin's ingenious yet complicated ideas and puts them in layman's terms. Justin makes his tech content stand out by sharing his diagrams on social media in a storytelling fashion. Growth.ly is a growth marketing agency that helps startups generate growth by identifying ideal audiences across channels, creating automated 1:1 interactions, driving targeted traffic to the business, and converting and acquiring more customers. We’ve talked to a whole lot of customers, but we’ve never heard of anyone sticking their flowcharts in Snapchat. That is, until we met Justin Wu. Justin presents his Lucidchart diagrams via Snapchat and Instagram. Naturally, we geeked out…and deemed Justin a downright genius. 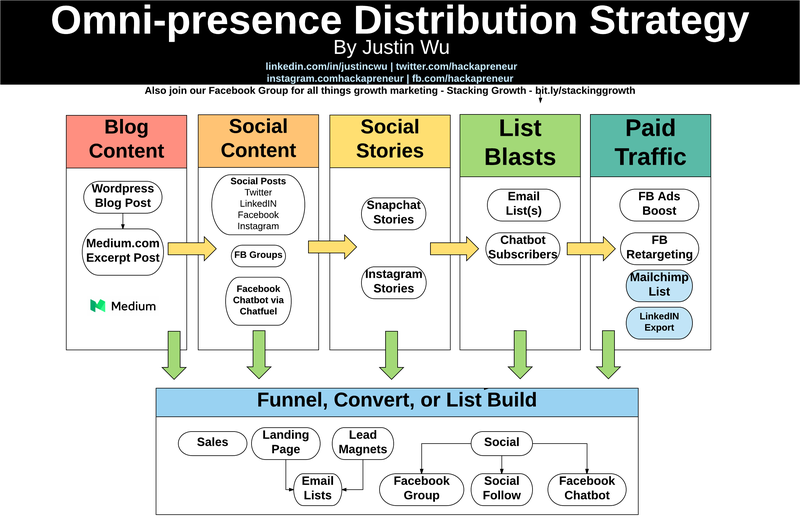 Justin Wu is the founder of the growth marketing agency Growth.ly. His clients range from Kickstarters campaigns to established B2B customers to apps. But that isn’t Justin’s only gig. He’s also building out his personal brand and is known for his daily growth hacking tips. Lucidchart has become his trusty sidekick for both endeavors. When trying to win a prospective customer’s business, Justin has found that a visual can seal the deal. In creating a proposal, he uses Lucidchart to build a roadmap of the proposed marketing sprint, or in other words, a visual flow of the deliverables and what they’ll achieve for the company. With so many proposals out there looking like one intimidating wall of text, Justin’s presentations stand out. “What I’ve found is that when you’re trying to educate small business owners or other people about what you’re offering, marketing is already over their head. You can confuse them with all that jargon. I like to just show them what I plan to execute so they know what they’re getting,” Justin explains. He breaks it down via flowchart so a client can clearly see the overall workflow and understand exactly what he plans to execute on—all without getting lost in a sea of words. “Before, I was just doing these big presentations where I would just show generic stuff that we do, but what has helped me land clients anywhere from five to ten thousand dollars monthly has been showing them specifically what I will be doing and showing the whole process and flow. That has for sure changed the way I’ve been able to close deals because it shows both the details and my knowledge and expertise." The visuals go beyond the high-level ideas to the nitty-gritty details of execution. And that has made all the difference. Justin is often asked to provide feedback from a growth perspective on client’s products. “Sometimes an engineer will come in and build an app, but it’s not the UI/UX that customers are expecting and there are elements you could change,” Justin explains. In conveying needed changes to a company, he has found it’s always easier to show, not tell. That’s why Justin uses Lucidchart to essentially complete a teardown of an app’s UI/UX. He will wireframe suggestions, or he’ll insert a screenshot of the current site and mark it up in Lucidchart. He is able to go through and critique the entire user experience. Once Justin has worked his magic, he exports the images and hands them directly to his client, providing crystal-clear recommendations that they can immediately act on. Justin is well known for his growth hacks. What makes his content stand out from the wealth of other tips floating out there? He makes it visual with Lucidchart. “It’s literally just breaking down different flows. Or if I’m going to talk about a specific growth tactic that requires a lot of really big concepts involved, I really try to break down some very complicated concepts and cut it down for people. For example, if you have to go data-scrape Kickstarter, take that data and push it through this tool, then take that data and convert it to emails, and then use this tool to pull emails out of it, I will break the different steps down in a diagram." Lucidchart takes Justin’s genius but sometimes complicated ideas and puts them in layman’s terms. Making his ideas visual helps his audience quickly grasp the new concepts and allows him to effectively share his hacks on all social media platforms. And that’s where Snapchat and Instagram stories come in. Justin will show his overall diagram to begin and then dive into the specific steps, showing one piece of the diagram per story. Justin often uses screensharing to allow his audience to understand how he uses Lucidchart, and he plans on livestreaming his diagram building in the future. “If I livestream, they’ll see me literally just create it—people don't believe me, and they think that when I create these kind of flowcharts and stuff, I've spent a lot of time doing it. But it's literally me creating on the fly,” Justin says. That’s one thing he loves about Lucidchart—he can create his diagrams quickly and easily, and he can do it from any device. A previous Visio user, Justin says Lucidchart “does that but better.” His favorite part is the versatility of Lucidchart. Visio is for “pure diagramming,” whereas Lucidchart aids him in all sorts of content creation for any use case. Whether he’s drafting a proposal or sharing his next Instagram story, Justin loves how Lucidchart helps him gets his ideas out of his head. “It’s cool for me to think about things like marketing campaigns and rollouts in my head, but Lucidchart helps me clear my thoughts and think a little bit better too. I’m actually thinking about the whole process and making sure I’ve considered every detail,” says Justin. Justin’s clients and social media followers appreciate and are impressed his deliverables. “I think a lot of people are missing out on this. A lot of people are just jumping right in without planning, so for me it’s been a huge advantage to plan the process first and execute later." Amen to that, Justin. We’re lucky to have such talent on our side of the visual revolution. Make your content stand out with Lucidchart!